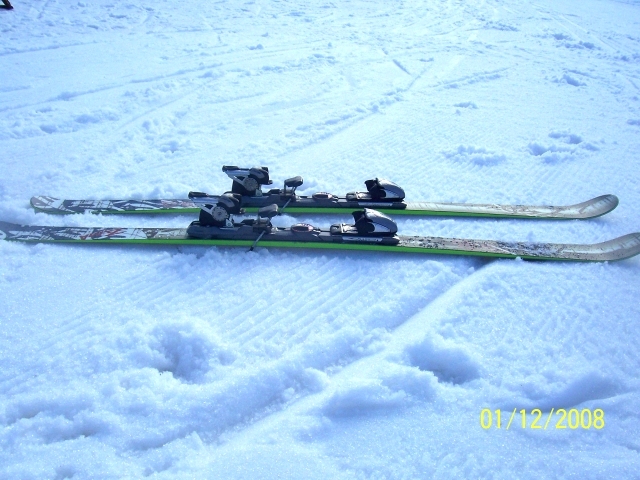 Japanese corporation, skis manufactured at their Chinese factory. 9 - Because they are remarkably good for a $230 ski !! At this price, Mom and Dad can buy two pairs so the kids can trash them at will without guilt. Not a "cheap" ski...a really fun ski built very well. A very nicely made wood core/triax fiberglass sandwich twintip ski with an ultra-durable textured PU topsheet that skis really well, very easily and has lots of fun pop in the bumps, quick underfoot, predictable behavior and an absolutely rock-bottom bargain price point and impressive retail margin for retailers, built by a 50 year old ski company. Drawbacks are poor factory tune (or lack thereof) and ho-hum graphics. I dare any other twintips to ski like this for $230 usd retail price! Targeted at the family market (not the high-performance enthusiast) with an irresistable price, Swallow hits a home-run with this one. (just get it base ground before letting your kids out with this ski). Wood core, triax fiberglass sandwich. Available in 140cm, 150cm, 160cm, 170cm sizes. Remarkably nice ski with better construction and finish than many "popular" brands. Lively flex pattern with decent dampening, nice torsional rigidity and a highly-textured plastic (PU) topsheet (stickers do not like this topsheet...hard to get them to stick). Really uninspired, ho-hum graphics and color scheme, but $230 usd MSRP takes the prize. I can't think of any new twintip family market ski for $230 other than leftovers on Ebay. We typically test skis "out of the box" with the factory tune and wax. I clicked into these skis and nearly didn't make it to the lift 'cuz they were railed soooo badly. I could not turn them to save my life - and these are 170cm...a small ski for a 5' 11" guy. They were really, really edge-high from the factory. I took one scary run and immediately took them off and hand-tuned the bases to get the edges at least flush with the PTEX and beveled them a bit like a twintip should be. Then tried again. Yippie. 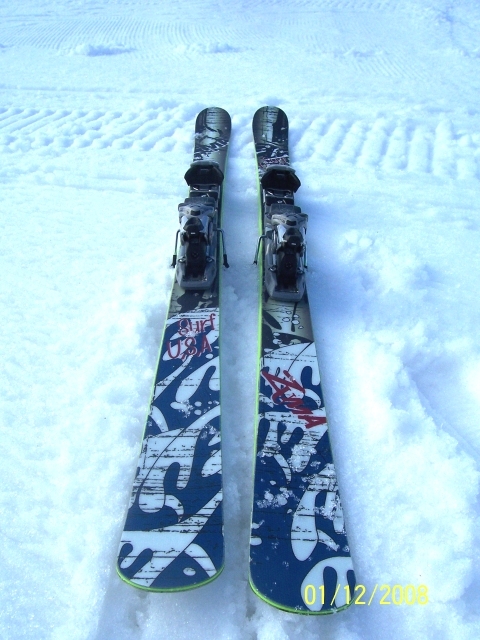 These little skis turned without any effort, spun 360s endlessly, loved popping in and out of bumps, doing any little jump you could find, turned quick little turns no problem, had plenty of zing if you got back on them and behaved really well. They handled surface transitions just fine, gave pretty good feedback to the feet and generally were just plain FUN. Ski them like a teenager who just got dropped off at the ski hill by the parents to rage around with his/her ratpack buddies getting yelled at by Ski Patrol.....and they're great. They can carve across hardpack and icy conditions predictably, smear and "slarve" turns at any radius pretty well, and generally work really well. They can get nervous at high speeds, but not so much that junior or missy will yard-sale if they tuck sections of their favorite hill. The words that stick in my mind after trying these skis is "Fun" and "kid pleaser". I would buy this ski for my kids as soon as they are big enough for the 140cm model....especially for $230 ! Bargains do exist. My reservations are the really poor tune out of the box (not a biggie, but something to watch out for), and the graphics won't get the kids all fired up...but then again...maybe it won't matter. My other reservation is the relatively narrow (these days) waist of 74mm. Many twin-tip kids want the "fat twins", not the narrow ones, but that's a matter of preference, and if your kids haunt the groomed slopes more than the trees and powder stashes, they'll work great. I put an intermediate teenager on these skis (he owns a pair of 2007-2008 K2 Public Enemy skis) and he came back after one run and said "these are amazing!". Maybe it was just the thrill of trying a "Japanese" ski...but that's what he said...he just plain liked 'em. I don't know how the durability will be, and there are very few dealers around, but their construction is very solid and the company is no fly-by-night operation. They've been making skis for over 50 years. They must do something right. The SnowJam Zuma Surf (SC-8) gets my vote for "Best bargain in kid's skis". A playful young colt ready to please the younger teenagers. Get a pair for my kids and put them away until they're big enough for them. For the price the Zuma twin tip just rips! Its perfect for your kids to go out and pound on and if they break just buy another pair! Great skiing ski if you don't pound on it too hard. However it had great edge grip was not slow to respond and linked turns nicely. It will get you the park under control so you can get it on in the park. May have a second application as a all mountain ski for lighter weight skiers. The construction looked totally bomb proof. straight side wall, dimpled top skin, manufacturing process is well finished. Great graphics. Honestly, I am not a park and pipe skier. However I have been known to go into the trees on a powder day and I bet you these would be great there. Quick and responsive. Nice damp feeling. JUst don't get it out too far from under neath you. It just doesn't have enough side cut to warrant that but its a park and pipe ski not a carver! Feels like a ski that costs 3X more. I give this ski a 10. Excellent value, good ski characteristics with great graphics. You retailers out there really need to take a look at these. This is just what you need to make a great profit on an affordable ski.